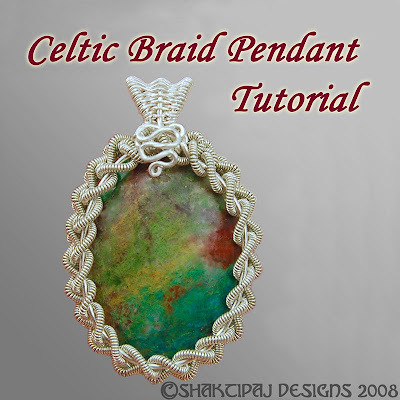 Perri's new tutorial - Celtic Braid Pendant ($12). I've learned a lot from this tutorial, I am sure you will be benefited too. Create the intricate sterling silver woven bezel pendant pictured for your very own! The instructions are for the specific pendant, but this extremely versatile wire weave can be used in ring shanks and borders of all types! This project is written for advanced wireworkers, but can probably be attempted by someone with high level intermediate skills who wants a definite challenge. Two FREE mini-tutorials will also be sent with the project: 'Weaving in Closed Spaces'(720KB) and 'Coiling with a Drill'(602KB). This tutorial uses the WigJig Centaur jig, and the WigJig Delphi has the same grid measurements. These grids have 5 holes and 5 spaces per inch in both horizontal and vertical directions. The project in this tutorial uses the diagonal hole placement which has 7 holes and spaces per inch. These measurements are crucial to the success of your project! If you own a different jig, then measure the hole placement to determine if it will work. The most common measurement is 4 holes and spaces per inch on the horizontal and vertical, 5-6 holes and spaces per inch on the diagonal. Here, diagonal hole placement will work for a lacier version, but the closer version is not possible. The only other readily available jig that has close hole spacing is the Wire Writer. The pegs are larger, and so the finished product is still a bit larger. Please understand that if you make this project with a different jig, it will still be a beautiful weave. But you will NOT achieve the exact same results!!!!! The tutorial PDF (1.9 MB) will be sent by Perri herself within 24 hours to the address listed in your PayPal profile after receiving confirmation of your Paypal payment, so please be sure your profile is up to date.